Simon is an accomplished software engineer and manager with 20 years’ experience, working in both small start-up and large established companies. He has a track record of developing innovative concepts into effective business applications and is named on numerous patents in mathematical modelling, software engineering and business processes. Simon has extensive project management experience, most recently helping a major Ravensbeck client to restructure its core product development and management organisation and systems so as to survive and compete effectively in a rapidly changing marketplace. 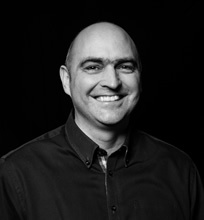 Simon was Technical Director of Right Information Systems until it was acquired by Cognos Inc. of Canada. He went on to work for Cognos for 10 years, leading a number of successful development teams, both in Canada and the UK. He co-developed and programmed the mathematical and software concepts and algorithms which underpin the innovative segmentation techniques used by Clusters Limited, and is working on Ravensbeck’s new media and technology venture developments. Simon is an astrophysicist, having graduated from King’s College, London in 1988.